ok this part is more about the extras etc. 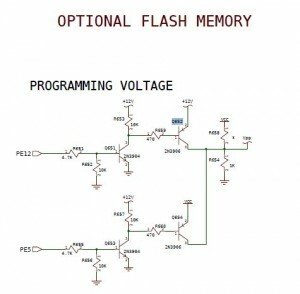 oh part of the nonsupported flash option. so. THIS can sure be skipped. Will be removed in future. 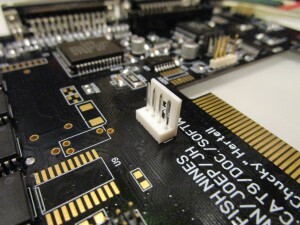 First of all before talking about the AD724 I have populated above the IDE Connector. 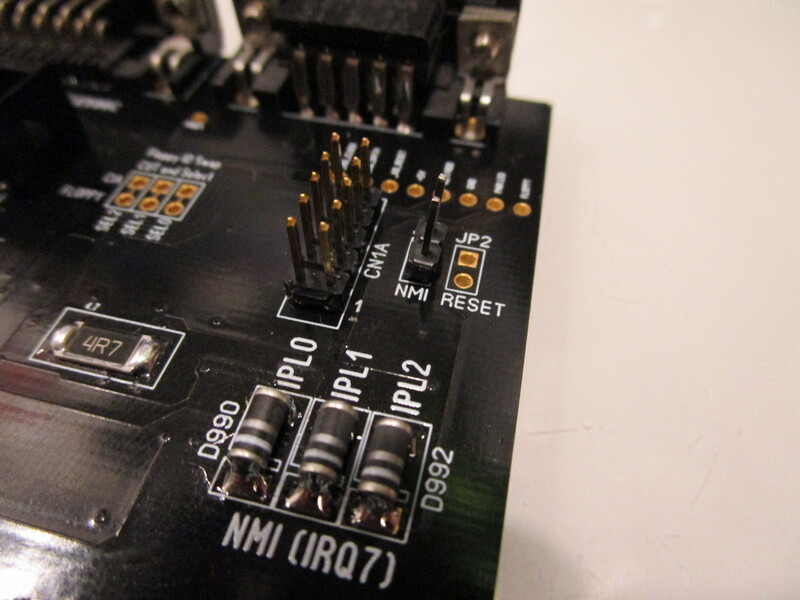 you can see 3 0ohm resistors that selects either PAL or NTSC. this is configured for PAL. 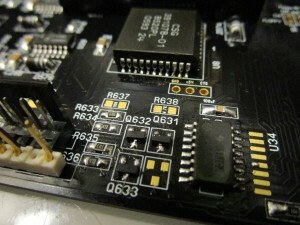 the Bottom resistor R63 tells alice what mode to start in as default. 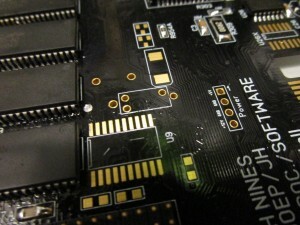 the other 2 is for the composite chip and timing. so you MIGHT want to put a jumper or so on R63 if you want to be able to switch between PAL and NTSC screenmode. 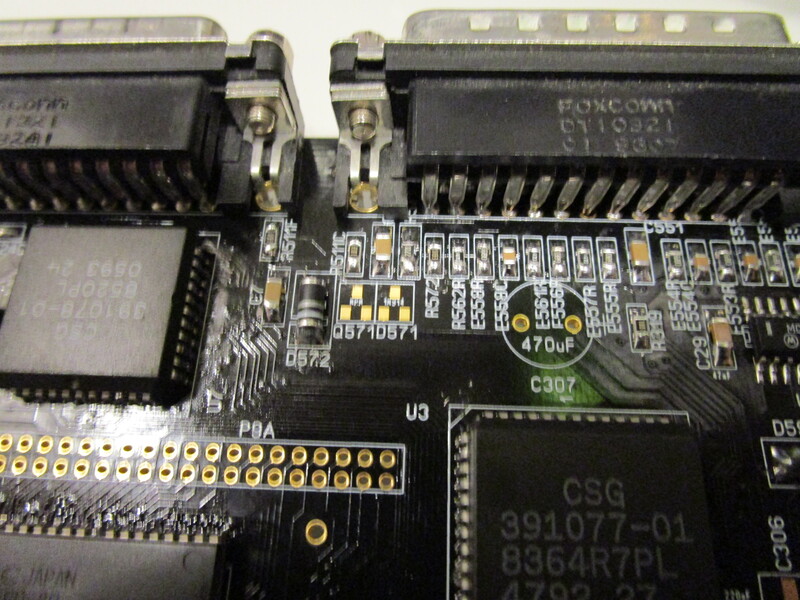 Well the AD724 is the chip doing the composite and Svideo. 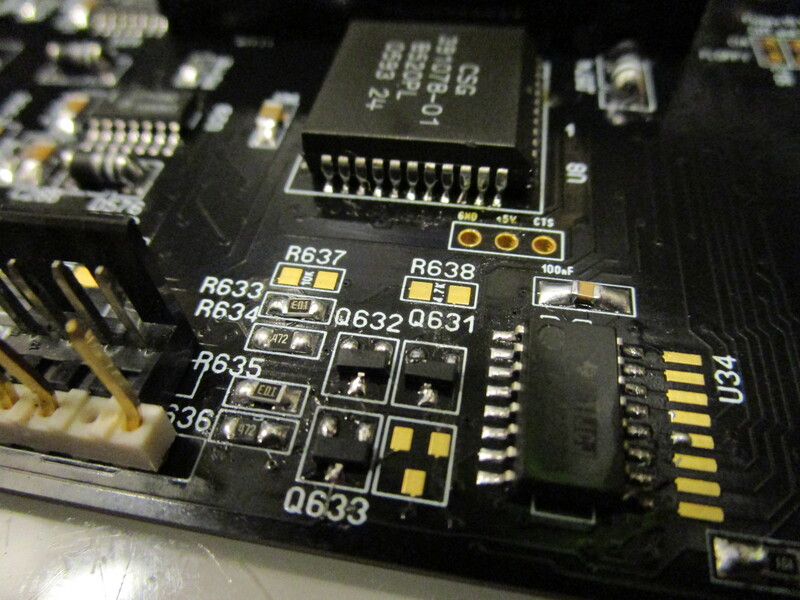 instead of the obselete CXA chip on the A1200. make sure the oscillator does not short with the SMD pads opinted out here on picture. Now add the 220uF (huge) caps and composite connector. and you are done. the trim cap needs to be adjusted. here there have been reports of issues. it seems that SOME trimcaps works better than others. will investigate in this. This is a handy tool for coders as some assemblers (asmpro etc) can enable a IRQ7 function that makes it possible to break eternal loops etc. 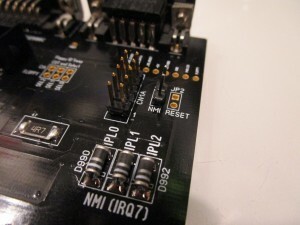 When you short NMI you trigger a IRQ7.. if no software handling IRQ7 is installed. you will notice that the machine just will pause when the button is pressed. Shorting this and the machine will simply just reset. this is a special led. it is not really connected anywehere. you can see a header at the top. this is input and output. 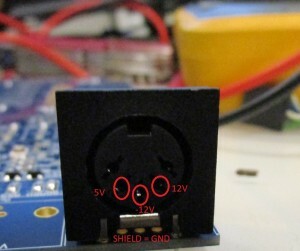 the right hole is the input to the led. 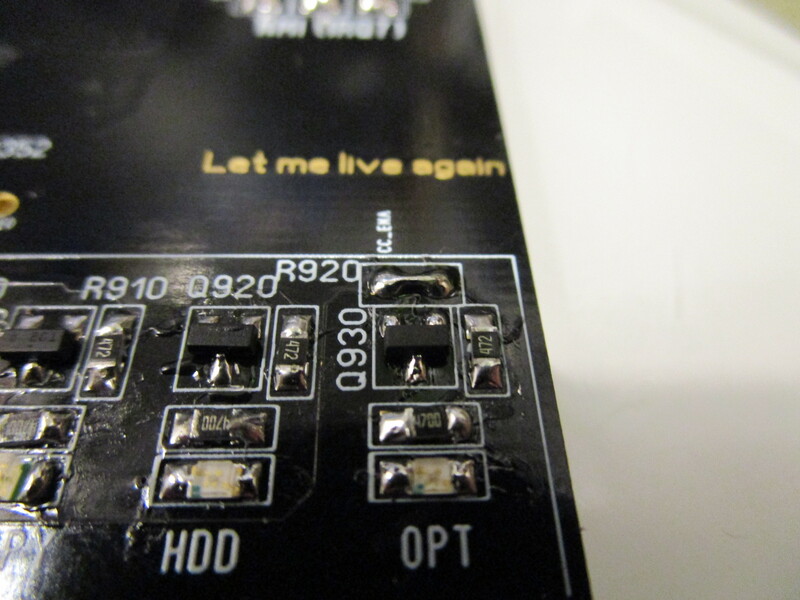 technically you can put in a led here and solder a wire to the right pad and to anywhere you want to trigger the led. This is “fire” button of port 0 and 1. I did put them here to be able to access those signals if you want to do a automatical kickstart switch or so based on those. 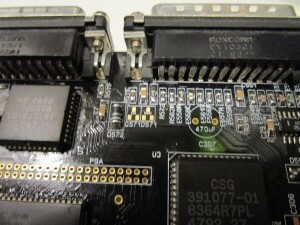 Proms with Kickstart 3.1 and Kickstart 3.1.4.
outer pins, not used. 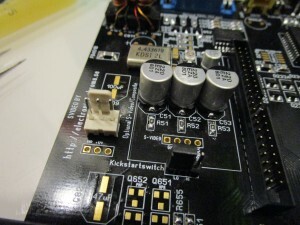 In early versions I had double 5V lines. this however was a misstake as pins for the square would make a short to ground. I have a problem, the D900 diode is blinking, and the green screen is showing. then chipmem tests in diagrom should fail. check for bridges. It can also be bridges at budgie and the GAL making this. I have the same green screen. I used NOS AGA chipset, NOS ram chips thinking it might be my old ram chips. 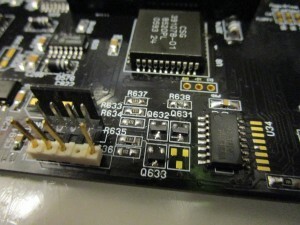 Checked all solder connections for bridges, none found. I have REV 1.0 RE-Amiga board if this helps. 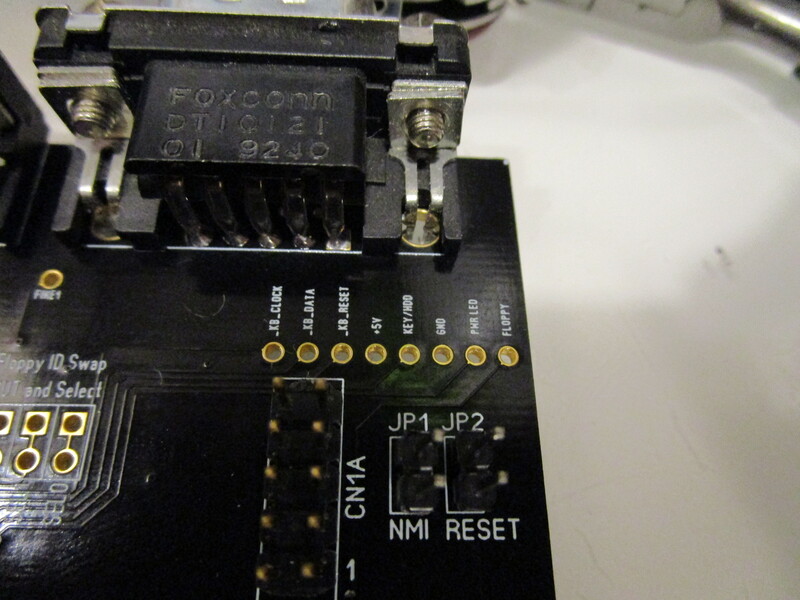 I tried DiagRom but i do not get a clean signal from the serial port even with a NOS Paula. Restarted with a rev. 1.2 and i had the same symptoms. Rechecked all the solder joints and found some not so well soldered ones in the AGA chipset. I re did them ALL and now a have a working reAmiga 1200! Thanks alot!!! Thank for your reply Chucky. ‘l’ll try your method. 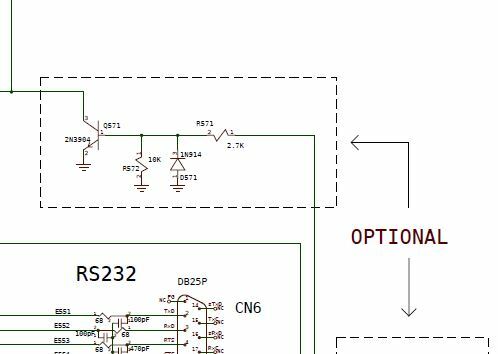 I am not sure if it’s related to the problems you guys are having but it was pointed out to me by the guy who did mine that the 100pF capacitor Mouser code in the BOM is wrong, it links to 0.01uF capacitors. should not be issues even if the value is off.. It certainly gives an issue. 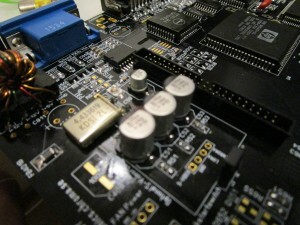 If you don’t belive it, replace all the capcitors with wrong values and your board does not boot anymore. Hi, I have a problem. 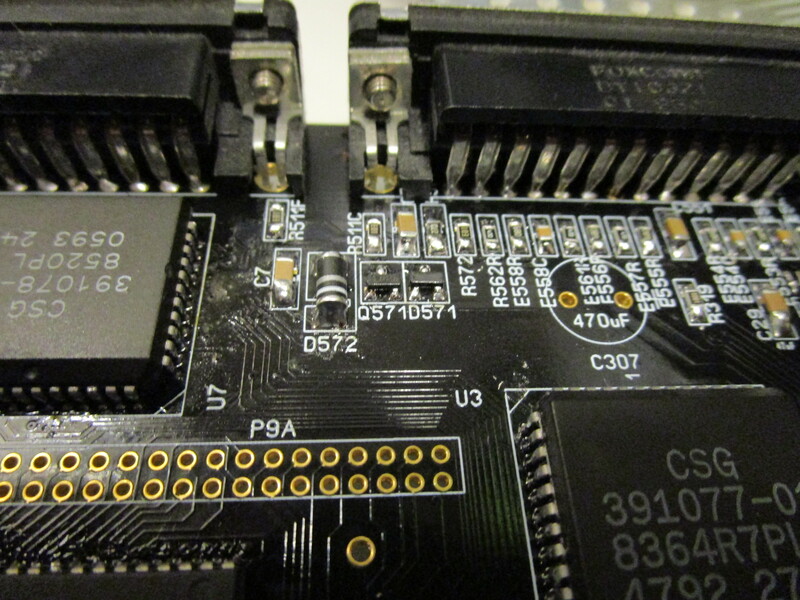 I have fully populated the amiga, and when I power the board – withoud anything attached, I get a white screen, so I do not think the kickstart kicks in :-). What am I doing wrong? Well what does Diagrom say? I did not succesfully flash the diagrom, will try it again. 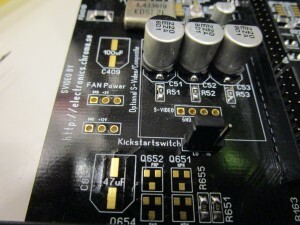 I tried to power the amiga with and without kickstart, and did not see any different results. Both I get a white screen. Reflashed the diagroms, but same result. 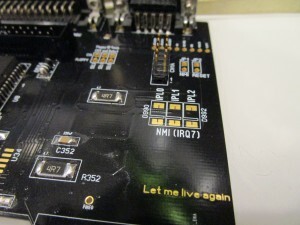 I actually have made 2 boards, both have the same issue, there must be something wrong in my actions. I used existing chipsets, including GAL. 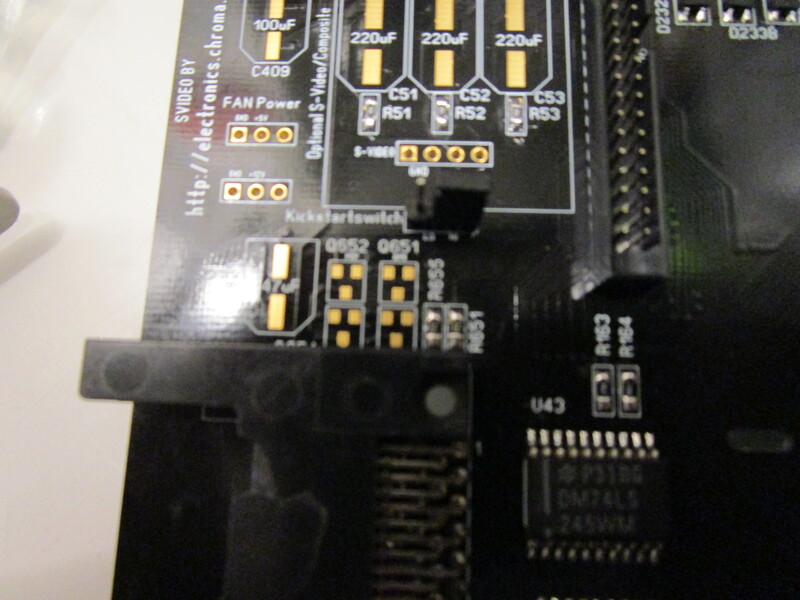 They come from two different PCB’s: one with videodac with zenerdiode and one without zenerdiode. Please help!! Hi Chucky, everything is working so far except for the mouse. The buttons are working but it does not move the cursor. I checked for voltage and it get +- 5V. Tried a joystick and Joy port works. I know they do not send the same signal but what i want to know is what chip catches the mouse up and down movements so i can troubleshoot it. i’m not too good with schematics sorry. Not the cursor but the pointer, sorry. I was troubleshooting my mouse up and down problem and found out that U34 is not connected to ground on pin 8. I have a 1.2 board. Though it did not fix my problem. Ground is ground. 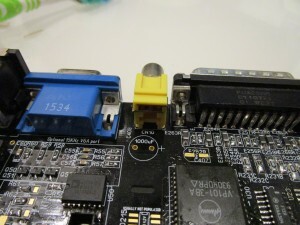 If the chip is connected via pin 1 (which it is), there shouldn’t be a problem. To see what I mean, you can take a continuity test between pin 1 and 8. 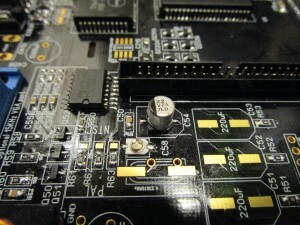 If both are ground in the chip’s pinout you will see that they are connected internally. However, I’m having the same problem as you: Mouse buttons work, but movements aren’t registered. I’ll investigate this further. Hi Torsten, did a continuity test and pin 1 and 8 have no contact between them. 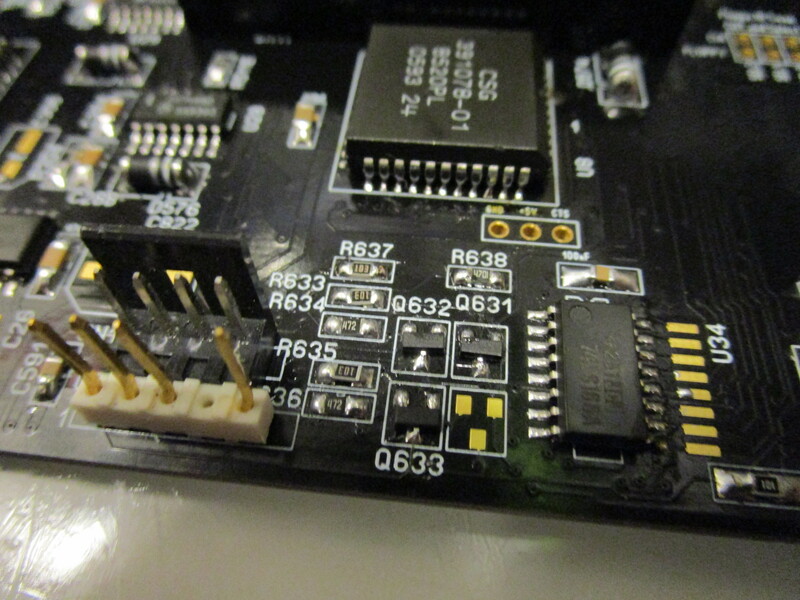 Compared my rev 1d4 and 1d1 boards that i have and pin 6 and 8 are grounded but not on the reamiga. Maybe it’s a manufacturing fault. But I’m not blaming anyone, this project is too much fun! The pins 1 and 8 are not connected internally, you can measure that yourself. There is no ground on pin 8, and there is no ground on pin 6 either! The ReAmiga gerber has errors. 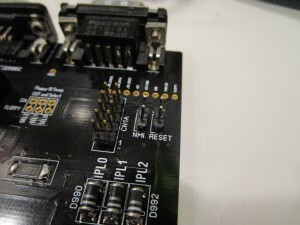 of course, you are right – there shouldn’t be a direct internal connection between pin 1 and 8. Just my bad. 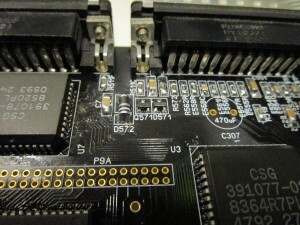 And you are right that only pin 1 is grounded on the ReAmiga, and pins 6 and 8 are not. They are only interconnected. And there’s a via from pin 8 obviously going nowhere. I think that’s where the ground connection was supposed to be. I don’t think it’s a manufacturing fault. The connection is missing from Chucky’s original Sprint file, too. I’ll try mine with a jumper wire from pin 8 to ground and see if it helps. At the moment I’m out of ideas. Chucky, can you say something about it? Btw., I’ve had to remove the jumper wire between pin 1 and 8 of U34. For some reason, putting pins 8 and 6 to ground couples +5V and GND with a very low impedance of about 20 Ohms. Mouse works flawlessly, even if pins 6 and 8 left floating (or better: just connected to each other). However, my floppy problem (s.b.) remains. According to my oscilloscope, +5V goes down to 4.8 on occasion and there’s some ripple, too. Oh there have been action here. I have been far too busy with my ReAmiga 3000 work..
ah mouse can be wrong! there was a fault in the BOM! 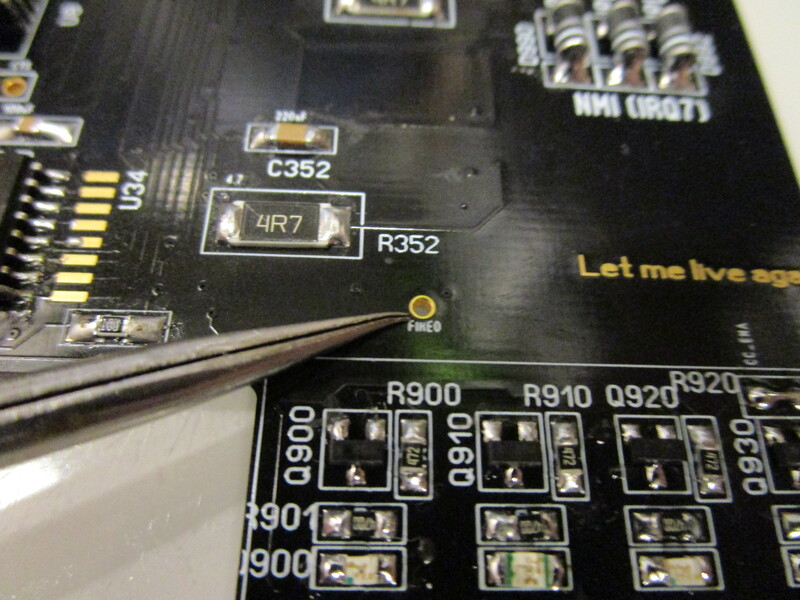 the 4.7Ohm resistors to the power for the mouse. 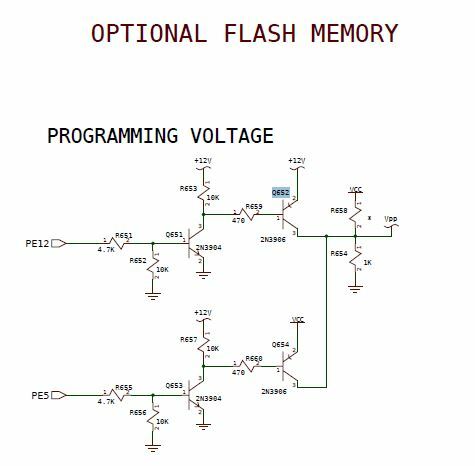 in the original BOM they was 4.7K instead of 4.7. this can (will) make the mouse behave wrong! Thank you guys for the info. I will be changing resistors and hopefully see a sign of life. It’s now working swapping the resistors. good to know. Will swap mine next week, as soon as the new ones arrive. 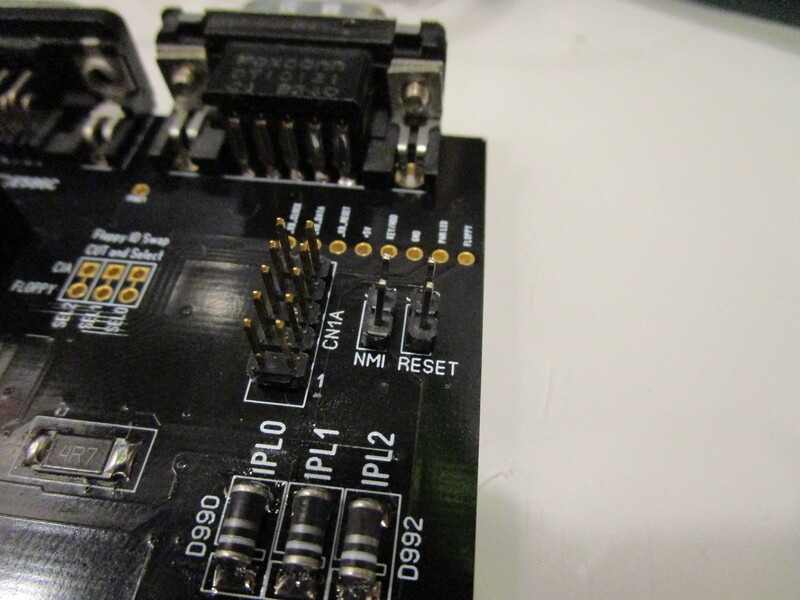 Thanks Torsten, will be ordering new ones too because I tested with old resistors from a dead board. Thanks again and have fun with your new Amiga. Ok, I changed the resistors and mouse is working fine now. 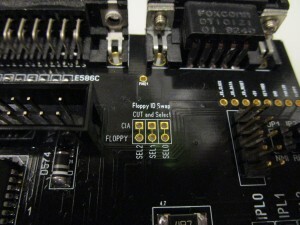 The ReAmiga won’t boot from floppy. At least not from a real one. I connected the internal drive (it’s from my original Commodore A1200 and worked there up until I last tried). It makes the usual clicking noises and upon bootup, the floppy LED flashes. The drive motor is starting to spin and the Amiga tries to boot. The screen goes purple (like the KS background) and after about 3 seconds of trying to read from the drive, the KS animation returns. 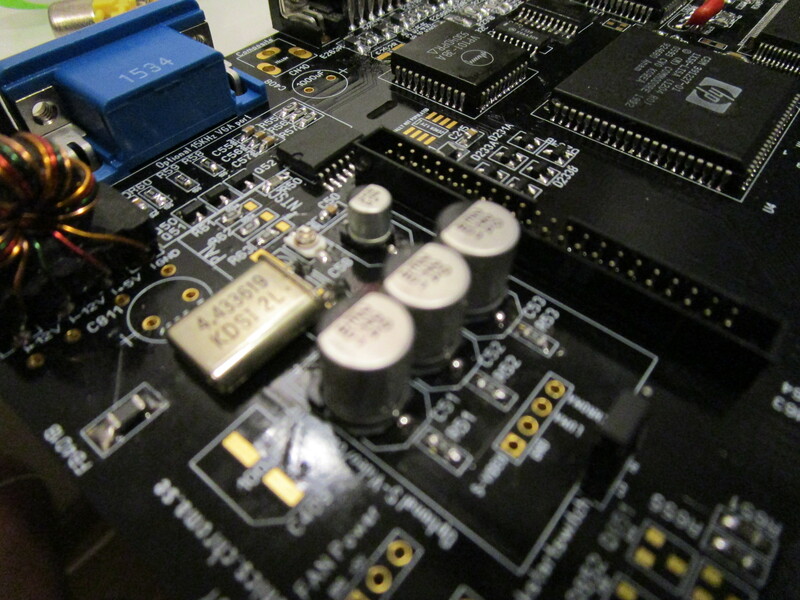 I also tried an Amiga 500 drive as internal – same effect. Now for the funny part: I connected an external drive that doesn’t even bother to click or do anything. I then daisy chained to this seemingly dead drive an external Gotek USB floppy emulator. This one boots just flawlessly. 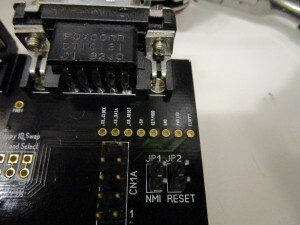 And it does so, too, if I connect it directly to the 23 pin external floppy header. I now have two suspicions. 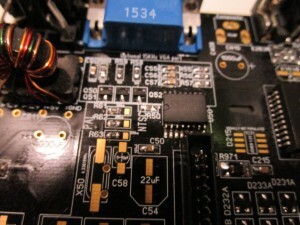 1) There is some power issue that prevents the real drive from working but doesn’t affect the Gotek. There’s a funny thing going on that supports this hunch: When I booted into workbench and insert a disk into the real drive, the screen eventually blanks several times, then workbench utters a read error. My multimeter, however, shows steady 5.06 V on the +5V line. 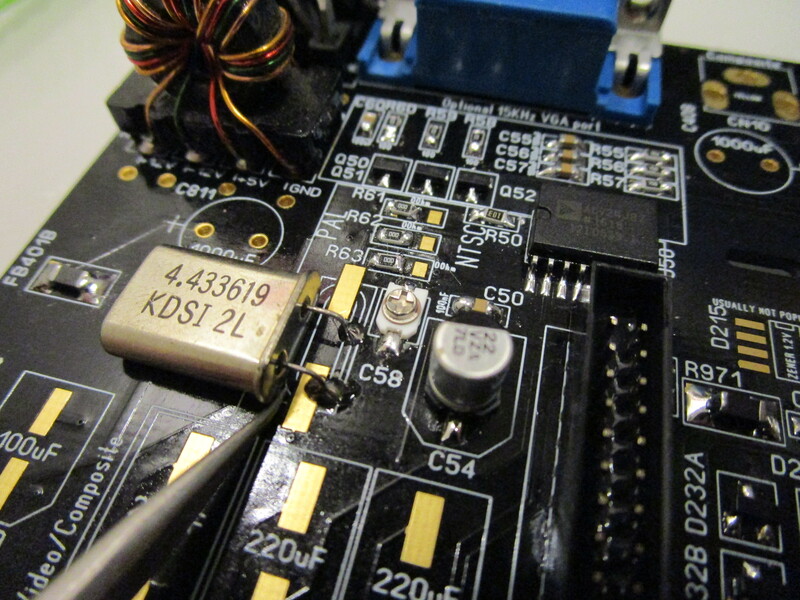 2) Some signal does not reach the real drives that they need to function, while the Gotek is unaffected by that. 3) I am missing something completely here. When booted to Workbench, I also realize that Alice gets reasonably warm to the touch. About 40 – 45 ° I’d say. Is this normal? After removing the jumper between pin 1 and 8 of U34, Alice doesn’t get that warm anymore – so that’s about that. - I hooked up the internal floppy to my lab supply. It still doesn’t boot and I get read errors once booted into workbench via the Gotek, but the screen then stopped turning black intermittently while accessing the drive. - Read errors often occur for blocks 56 and 60 which makes me wonder whether the drive is able to change tracks at all. 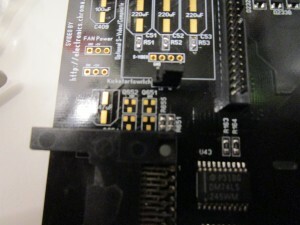 - And: Chosing one of the connected “real” drives (either DF0: or DF1:) to boot from in early startup results in red screen and flashing LED and often yellow screen afterwards. This is true regardless if both drives are connected or only one. Hi Torsten, i have the same problem but with DF1: drive. The error is “Couldn’t format cylindre 0″. I tried various 1010 and 1011 drives but they give me the same result. I know this won’t help you but a least you won’t feel alone in this. hehe. Thanks, Juan, that gives me some comfort indeed. Btw., where did you buy your board from? Did it come as a kit with passives? 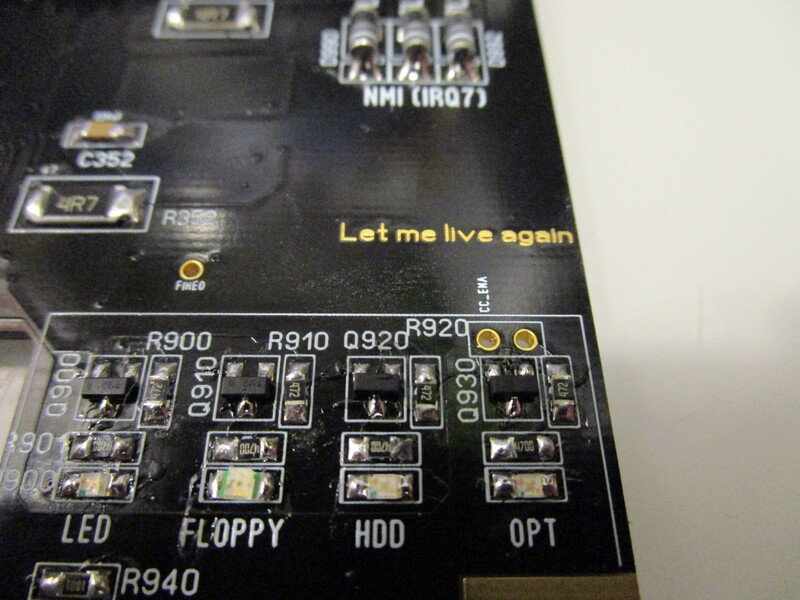 Mine was only the motherboard from fleebay. I ordered my passives from Mouser. could maybe C591 be of wrong value? My schematics says 10 nF, while according to the locator, I put 100 nF there. Does this even matter? Anyway, this would be the decoupling for floppy +5V. just another question: What Budgie Revision are you using? I’ve build the ReAmiga with NOS parts, and got a -02 Budgie this way. 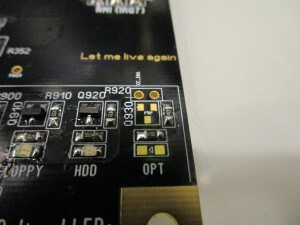 I don’t know if this matters much, but as it seems, Commodore modified the circuitry a bit for the newer Budgie. However, I don’t think this has anything to so with my Floppy problem. Thanks for confirming this. 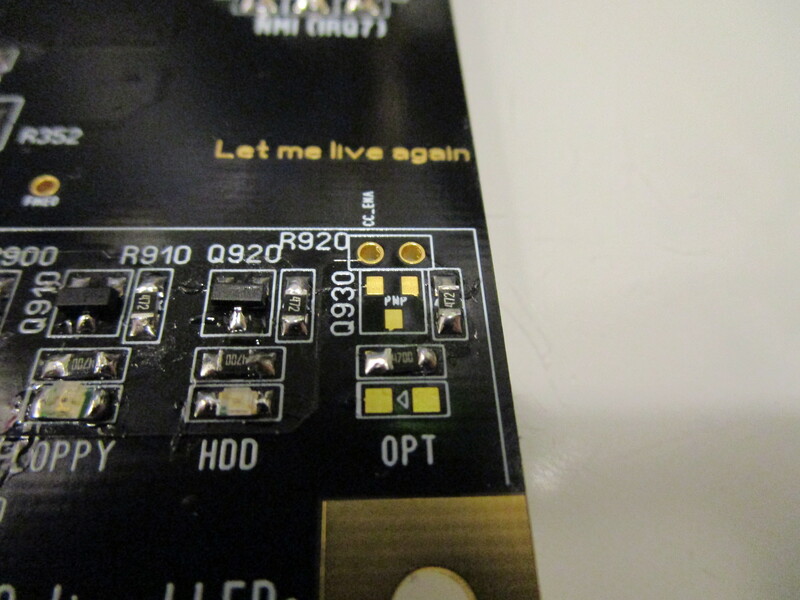 I’ll probably try and desolder (or at least reflow) even CIA on Monday. Maybe there’s some hidden short. Maybe I should even put sockets for both CIAs. This way I can try spare ones easily. Oh my, I now socketed both CIAs and Paula. Produced a short on the socket of CIA A in the process. Tried to pull out the CIA with a PLCC tool, but because of the narrow space between the socket and the parallel port ripped off half of the socket in the process. Now, in DiagROM both CIA tests fail, parallel port is almost completely BAD and left mousebutton (aka Fire0) doesn’t work. It certainly all comes down to U7, but I still don’t know, how many of the 44 pads are still kind of intact. At least, U7 gets warm to the touch, so the row towards the front edge of the board seems relatively unharmed. Sad to read… In the meanwhile i’ve found my problem. It looks like my new floppy drive that i have bought from amigastore.eu is at fault. When plugged in it makes floppies from df1: unreadable. So I just tried with an original floppy from my A500 and all works now. I may have been extremely lucky. 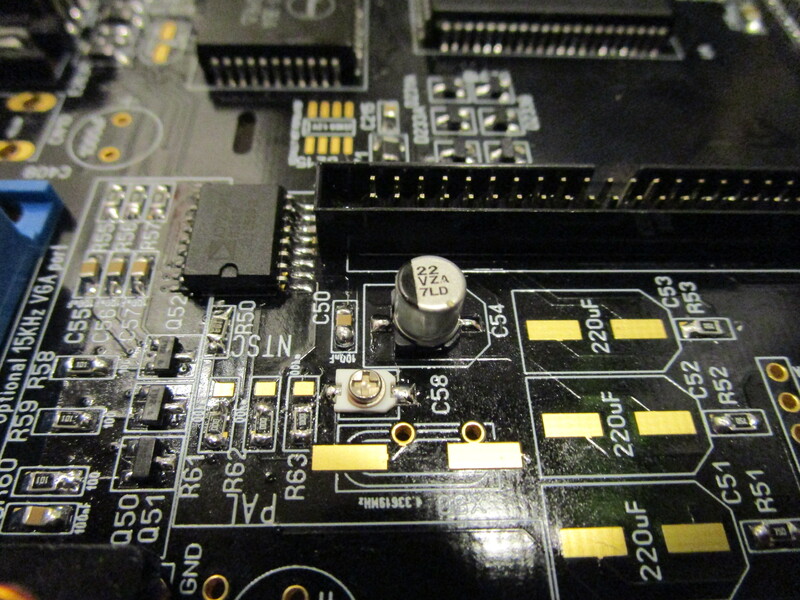 Desoldered the U7 socket and found no apparent damage to the board. All pads I probed are definitely still firmly connected. My guess is that the sockets I used are just crap. They apparently just sticked to the board but didn’t make a firm connection with the solder paste. I now ordered proven to work brown sockets and will try again as soon as they arrive. 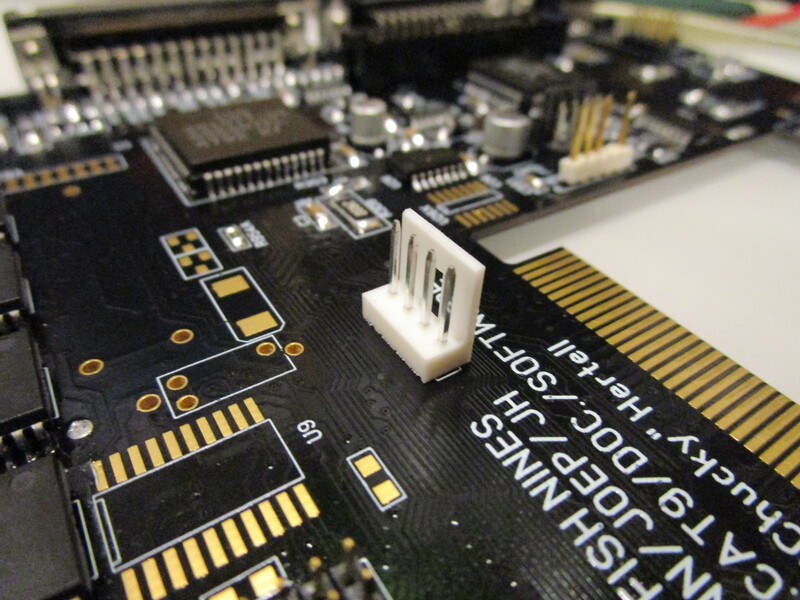 Both CIAs are socketed and pass all tests. Mouse/Joystick/Serial/Parallel are fully working. However, booting from floppy does not. 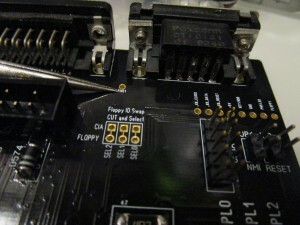 This is true for spare Paulas and CIAs as well, so the chips don’t seem to be the problem. I’m now again suspecting Gayle, since it has some bits of the floppy logic and IDE doesn’t work properly either. Maybe, there’s still some hidden bridge.